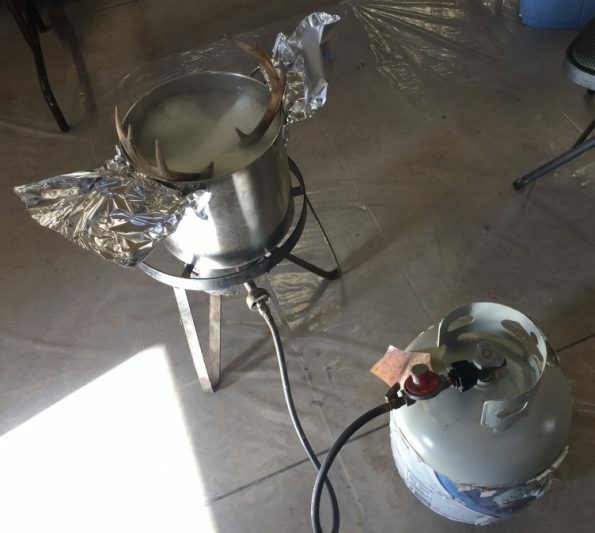 Antler soup – You probably have everything you need to do a European mount. They take up a lot of space for display. They just seem unnatural to me – taking the skin and stretching it over a form, add some fake eyes – no thanks. If I want to see the beauty of a deer, I’ll go sit in the woods. My house doesn’t have a room where it would be “acceptable decor” (ie: my wife would never let me put it in the house). I’ve always gone the route of making European mounts. There is a “pro” for the European method countering every “con” I just listed for the taxidermy mounts. 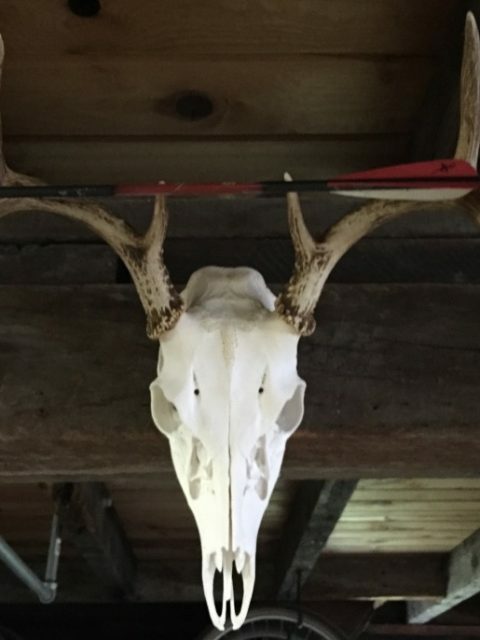 The only unnatural part of a European mount might be the bleaching of the skull, but if you are a stickler on that point, you could just leave the skull natural. As for display – they look awesome on the support beams in my garage, my barn, and there are even a few spots I can display one or two in my (very) small hunting cabin. A DEDICATED stock pot. Stock pot sets are pretty cheap if you don’t have one. I make my stock in a more expensive pot, but having a set of the cheapies is great because you tend to have to transfer liquids around for filtering. I stole the 16 quart pot out of my cheap set and dedicated it for European mounts. Trust me, EVERYBODY makes a face if they learn you used your “skull” pot for making their dinner, so keep one just for this purpose. A place to cook it. DO THIS OUTSIDE. Your grill’s side burner will work fine. A camp stove will do in a pinch too. Nothing beats a turkey fryer. You can even buy just the base on Amazon, for under $50. These puppies crank out some BTUs and get your water up to boil MUCH faster than the other methods. Since you are using your dedicated antler pot, your fryer pot remains good to use, safe from those scornful looks. Some scraping tools. I like some of the tools available in this scraping kit. You can get a similar set cheap at Harbor Freight. They are sharp enough to scrape material off the bone, but dull enough to not cut or mark up the bone. You could also use a standard hobby knife set. The rounded blades work great. A plastic shoe box for bleaching. The size is perfect for a skull, PLUS it makes a great storage box for your scrapers and other “skull cleaning tools”. Soda Ash aka Washing Soda aka Sodium Carbonate. This is the magic ingredient. You can get it for around $5 at Walmart, in the laundry aisle. It’s also used for balancing pH in pools, so you may already have some for cleaning or for your pool. Hydrogen Peroxide. The standard brown bottles you use in your first aid cabinet. Get 4 bottles. Ok, I know all that stuff adds up to more than $5. BUT, you probably already have most of these items, or a suitable alternative. 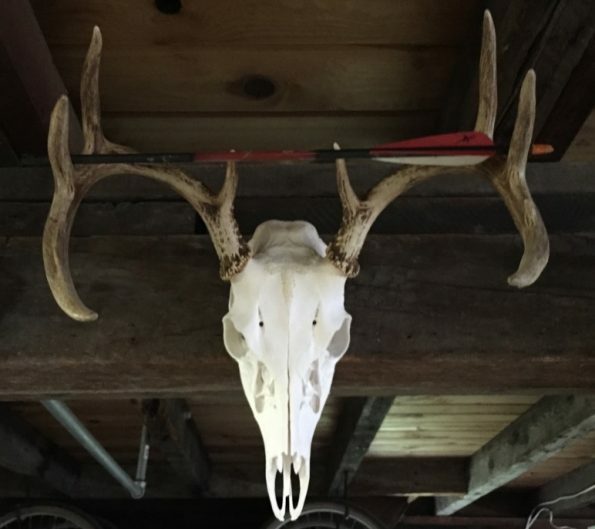 Even if you had to buy everything on the list, you are still under $150, way cheaper than a taxidermy mount. The washing soda has enough to last you for quite a few skulls, so that is an “every few years” purchase. So now you are down to 4 bottles of peroxide per skull. Under $5. A turkey fryer and a dedicated stock pot GREATLY speed the process up. This job is not for the squeamish. I skin and quarter my deer at camp. Once the quartering is done and the meat is in the cooler, I’ll skin the skull and remove as much meat as possible (including the eyes). I remove the lower jaw as well – though I save it for aging my deer. Removing it just makes it easier to get more meat/material off the skull. Once I’ve butchered my deer back home, I’ll usually get to the skull within a few days. I just hang it in a bag in a tree till I’m ready. The bag keeps the bugs off. Bugs won’t hurt it, it just makes the process a bit grosser than it needs to be. Here’s the grossest part: I like to get as much brain matter out of the skull as I can. I use a small hook made from a coat hanger. Simply put it in the back of the skull and start pulling stuff out. If you are too grossed out, you can leave the brain in till after the first cooking process, but I find it helps to get it out sooner. Get enough water to cover the skull boiling in your pot. MEASURE as you fill it. Some stock pots have handy measuring lines. Mine usually takes 3 to 4 gallons to get the skull covered. The water can cover the base of the antlers, they’ll be fine. Add ½ cup of washing soda per gallon of water. The washing soda is amazing. It helps degrease the skull and separate ALL material from it. Add the skull and cook it at a rolling boil for 30 minutes. If you just boil it with no washing soda, it might take you 8 hours to achieve the same results. I throw the cleaned jaw bone in with the skull while it’s cooking – I save them for future reference in aging deer I’ve shot. Having a real example is way better than comparing to pictures. 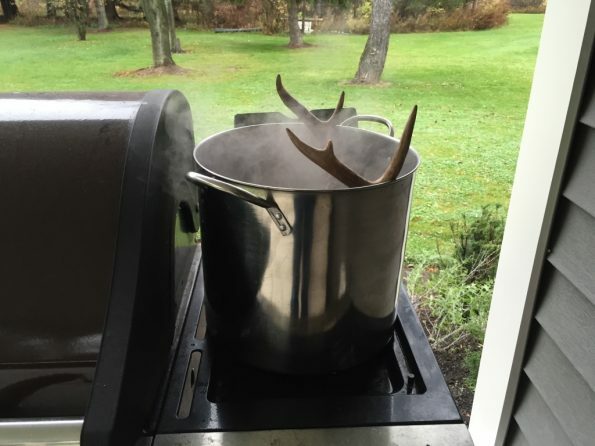 If the antlers are overhanging the outside of the pot, I’ll make some protective wings out of foil, just to block some of the heat from the burner from hitting them as it goes up the sides of the pot. After 30 minutes, take the skull out an hit it with a hose. My sprayer has a nice “jet” setting that pretty much blows any remaining meat off the skull. Spray out the brain cavity and the nasal passages. Be a little more gentle on the nasal passage – you don’t want to damage the delicate bones in there. Wear goggles or safety glasses when spraying. High speed water hitting odd shapes with gook at close range… umm, well, just speaking from experience. Once the hose does its work, use your scrapers to remove as much remaining material off as you can. It’s a little tedious, but none of the work is difficult. Get some fresh water (just water) boiling while you scrape. Once you are done scraping, boil the skull for another 30 minutes, and repeat the process of hosing and scraping. Keep the water boiling while you scrape, if it needs another round, pop it back in the bath for while. Repeat till the skull is totally clean. During the boil, you want a careful rolling boil, not a hard, violent boil. Boiling too hot, or for too long will make those upper “lip” bones fall out, and possibly the teeth. You can notice these start to loosen when you are scraping, so keep an eye on them. If they do fall out, you can glue them back in later. Soak the cleaned skull in plain old hydrogen peroxide for a brilliant white. Now that the skull is clean and rinsed again, put it in the plastic shoe box. 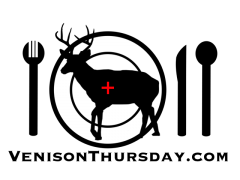 Pour in the hydrogen peroxide up to, but NOT TOUCHING the base of the antlers. 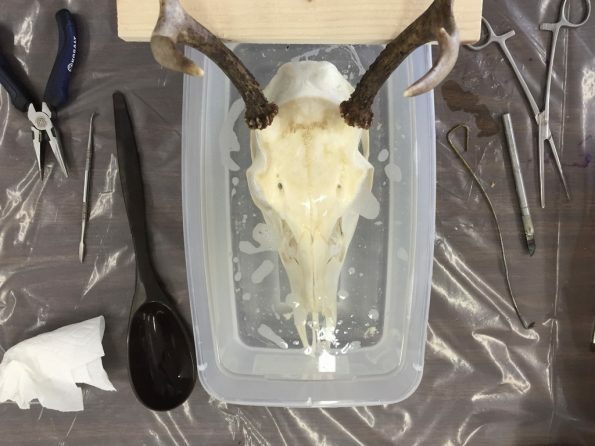 It WILL bleach the antlers, so try not to splash any peroxide on them or let them sit in it. If you do splash them, just pour a little water on them to rinse them. Let it bathe in the peroxide for a day or two. You’ll notice part of the skull will be above the peroxide. Use a spoon to gently pour some of the peroxide over that portion of the skull every so often. Take out of the peroxide and let it dry. Sometimes I rinse it in water, sometimes I don’t. A final rinse doesn’t seem to impact it one way or another. If any of the teeth or bones fell out, put them firmly, but gently, back in place, and let it dry out. If any of the bones are still loose once dry, you may need to glue them in, but letting them dry in place is usually sufficient. If the antlers became bleached at all, you can touch them up with some wood stain. Sometimes I get some minor bleaching from the washing soda, but sometimes I don’t. Now find a nice place to hang your mount, you are done! European mounts are a (fairly) easy way to save a memory of your hunt, taking some time to do, but can be done very inexpensively.